One of the hottest topics in student loans is Public Service Loan Forgiveness (PSLF), and for a good reason. If done properly, you may have six figures+ of student debt forgiven with no tax bill! Plus, the first wave of eligible applicants were allowed to submit their official application for forgiveness in October of this year! So, we decided to take some of the most common questions from clients, prospects, and friends to compile a little guide for your burning PSLF questions. 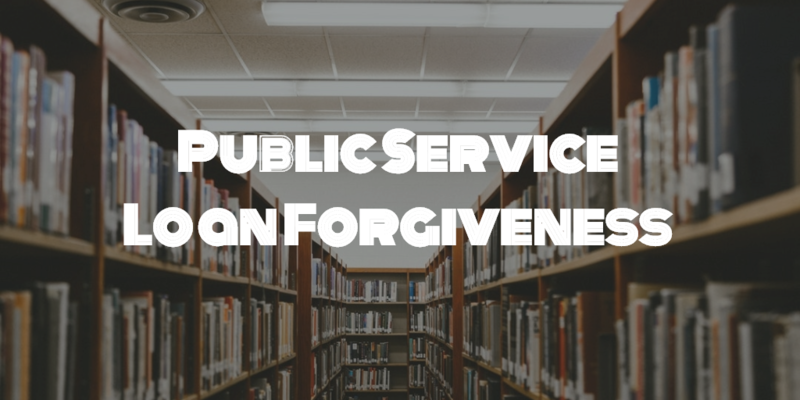 What are the Basics of Public Service Loan Forgiveness? If your loans are already federal direct loans, complete the Employment Certification for Public Service Loan Forgiveness form to confirm if your employment qualifies. This form verifies that you have completed the employment required for the program each year. Completing it requires you to fill in some parts and your employer to fill out the rest. While this is not a requirement, it is helpful for your servicer to track your eligibility. Please, please, please, complete this form every year and save it for your records. Even if you don’t change employers, take the time to document this for yourself each year. The best part is that any loans forgiven will NOT be counted as taxable income! This is drastically different than the traditional loan forgiveness programs. How Do I Know if My Loans are Federal Direct Loans? One of the biggest components to successfully completing PSLF is making 120 payments on your DIRECT loans. I can’t emphasize DIRECT loans enough! We have seen horror stories of individuals who assumed they had direct loans because they were on an income-driven repayment plan. Please take the time to confirm this, other federal loans are eligible for income-driven repayment plans. We have seen individuals who made income-driven repayments for years to only find out they were paying on Federal Family Education Loans (FFEL), and not direct loans. Also known as, those payments did not count! On the summary page, it should list each and every one of your Federal loans. Under the type of loan, you will want to see the word “Direct” before the other words. For example, DIRECT CONSOLIDATED UNSUBSIDIZED or DIRECT STAFFORD SUBSIDIZED. You want to see the word direct on any loans with current balances. The database will also list loans with “$0” balances. Please remember that the Federal Family Education Loan (FFEL) Program or the Federal Perkins Loan (Perkins Loan) Program are very common types of loans. However, they do NOT count towards PSLF, you would need to consolidate them into a direct loan via a Direct Consolidation Loan. Payments made on the FFEL Program loans or Perkins Loans before consolidating to a direct loan don’t count towards the 120 payments for PSLF. What is an Income-Driven Repayment (IDR) Plan? Well for the purpose of this conversation, these are only payments that count. However, if you made payments using the 10-year standard repayment, those payments also count. If you are in the 10-year standard repayment plan AND going for PSLF, you will want to move to an income-driven repayment plan sooner than later. Why? Well PSLF requires 120 payments and the 10-year standard repayment requires 120-payments so if you stay in the 10-year standard repayment plan, there won’t be any debt to forgive in 10 years. Our favorite IDR is PAYE, but if you had a student balance before 10/1/2007, you would not be able to use PAYE. You also need to have a new loan disbursed after 10/1/2011. Student loan planning is very detailed; I would argue it is one of the most detailed topics in all of financial planning. So while I can’t provide advice on your specific situation in this post, I can give you some good guidelines for IDR. If you qualify for PAYE, choose REPAYE or PAYE. PAYE is “usually” the better option for most. If you don’t qualify for PAYE, choose old IBR or REPAYE. REPAYE will be the lower option (10% of discretionary income vs. 15% with old IBR), BUT you can't separate income. REPAYE will be better for PSLF if your spouse has large loans or low income (due to the joint tax filing). Here are the details on all the types of income-driven repayment plans. How to Lower Your Public Service Loan Forgiveness Payments? One topic that is not talked about enough with PSLF is ways to lower your PSLF payment amount. We assume that you are already on the proper income-driven repayment plan at this point. So what are some ways to keep some extra cash in your pocket while staying on track for PSLF? The key thing to remember is that your PSLF payment amount is directly linked to your Adjusted Gross Income (AGI). The name of the game is how to lower your AGI (legally), which will help lower your student loan payment. 1. Contribute to your employer’s traditional retirement plan (not the Roth for right now). Examples would be the 401k, 403b, 457, etc. 2. Contribute to your own traditional IRA (again, not the Roth IRA for now). Keep an eye on your income amount, if you are eligible for an employer plan, the income limits are very low for deductible traditional IRA contributions. 3. Contribute to your Health Savings Account (HSA). This is one of our favorite tools for lowering your AGI, and the HSA is a great tool in general. 4. A few other ways to get your AGI lower are certain moving expenses, educator expenses, and student-loan interest. What Do I Need to Do Every Year for Public Service Loan Forgiveness? As I begged earlier, please verify and certify your employer every year and keep the confirmation from FedLoan Servicing for your records. Complete the Employment Certification for Public Service Loan Forgiveness form to certify each year. Verify your income and family size each year! FedLoan Servicing will notify you of this on your annual anniversary each year. Please do not delay on this, if you take too long they will capitalize your unpaid interest. While that is not a big deal with PSLF, it is very bad for all other loan repayments. Last but not least, apply for forgiveness after 120 payments and do NOT leave the public sector until you have confirmation and call three times (maybe ten times) to verify it was granted and completed. With the first wave of PSLF applicants happening right now (started October 2017) this process should get clearer as we progress. Here is the official formal application for PSLF. Will Public Service Loan Forgiveness Go Away? Well, the studentsid.ed.gov website doesn’t do a good job at making us feel warm & fuzzy on the inside when it says this, “We can’t make any guarantees about the future availability of PSLF. The PSLF Program was created by Congress, and Congress could change or end the PSLF Program.” Each time we get a new President, this becomes a hot topic. During the PSLF process, your debt balance will increase, especially in the early years where income may be low, and loan balances are high. We have seen some debt balance increase by six-figures while in the PSLF process, which is exactly why you would have to grandfather current individuals. I am not saying that I am right, but I just can’t imagine them removing or even capping the PSLF program outright on current individuals in the process. This is also why it is imperative to document every year that you are actively going for Public Service Loan Forgiveness. Student loans are complicated and complex, and one wrong decision can lead to large repercussions. Take the time to get your loans organized and make sure you have everything set-up properly for you goals. If you are not comfortable with all the details or just don’t have the time, spend a few bucks on a one-time analysis. We help our clients with student loans and build a strategy as part of their financial planning, but there are plenty of other great options out there. I listed a few at the bottom. Best of luck and don’t let paralysis by analysis affect your student loan planning. The sooner you have a strategy in place, the better.